For Memorial Weekend, I was lucky enough to be on Nantucket enjoying the amazing weather and wandering around town. 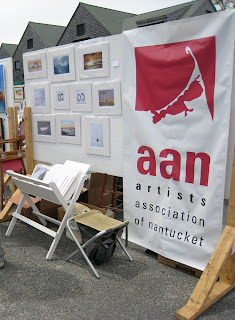 I was also lucky enough to be there for the Artists Association of Nantucket Side Walk Sale. Set-up right in the middle of town overlooking the water, they had the perfect spot for the influx of weekend tourists. I was there primarily to visit the mother of one of my good friends, Nancy Lindsay (of "Tanglz"), who does beautifully delicate crocheted silver jewelry. 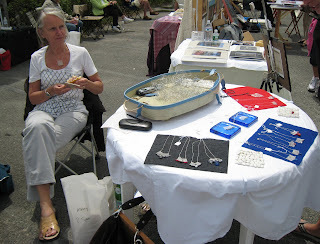 Surprisingly, she was one of the few jewelers participating in the show; most of the other artists consisted of all different kinds of painters as well as photographers. 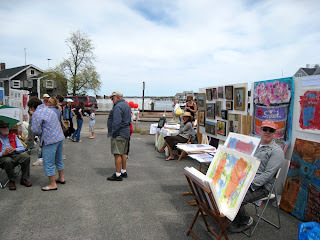 Many of the items for sale were all very affordable, which was refreshing! The Association puts on shows throughout the year. For more information, check out their website.